This is no April Fools’ joke! 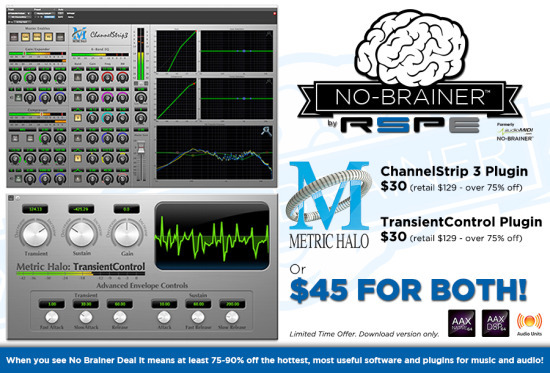 RSPE Audio Solutions has teamed up with Metric Halo to offer two of their most popular plugins, ChannelStrip 3 and TransientControl, for the No Brainer Deal price of $30 each (retail $129 - over 75% off) or $45 for both (retail $258 - over 80% off)! Channelstrip 3, the newest version Metric Halo’s best-selling and most feature rich plugin, is the recognized leader in console style channel stri­p audio processing for digital audio workstations. As the first plug-in to offer the combination of exceptional audio quality, incredible DSP efficiency and a comprehensive user interface, ChannelStrip lets users work as efficiently and interactively as they would with a dedicated, world-class mixing console. TransientControl, Metric Halo’s easiest-to-use and highly desirable plugin, allows you to modify dynamics in ways that aren’t possible with traditional compressors. You can directly change the transient (“attack”) and sustain of your audio; this allows you to make your tracks more punchy, or smooth them out so they sit in a mix. Don’t miss out! This is the only time on record these plug-ins will be available at these blow-out prices anywhere in the world. The Metric Halo No Brainer Deal is available for purchase via electronic serial number until midnight April 30, 2014, exclusively from www.rspeaudio.com. The No Brainer DealTM has an exciting 7 year history and reputation for offering “Flash Sales” at irresistible prices, hence “No Brainer Deal”. When you see “No Brainer Deal” it means at least 75-90% off the hottest, most useful software and plugins for music and audio production. RSPE have asked to add that if you are purchasing this product outside of the US, just enter “United States” as the country that you are shipping to, since this is a download, it will not adversely affect your purchase. They apologize for the minor limitation, we are addressing this with their host company. Update: RSPE has fixed the issue with international credit card processing. You should now be able to complete your purchase normally, using your actual billing address and country.